Sylvain Chomet, the visionary French filmmaker of The Triplets of Belleville, didn't make it to the Toronto International Film Festival in September. Triplets is my favorite movie of 2003, and I wanted to meet its creator. "I'm the second choice," Evgeni Tomov, Chomet's right-hand Production Designer/Art Director told me. "One reason he's not here: Sylvain is afraid of flying. Second, he's focussing on a new film. The third reason: he was skeptical about the the perception of Triplets in North America, saying 'It's the year of Finding Nemo. It's not a great year for French film.' He told me, 'I don't want to think of Triplets now.' He did interviews at Cannes and he was a bit worn out." To whom was I talking? "I'm half-Russian, half-Bulgarian," Tomov said. "I lived in Kiev, my family moved to Bulgaria, where I grew up. Fourteen years ago, I defected. I immigrated to Canada, and I've been living in Montreal ever since. I didn't like the experience of a Soviet state. I never regretted leaving. My parents are still there in Bulgaria. I visit on the average every two years, and I still find it uncomfortable. "I studied Fine Arts and Illustration. I was doing it for years before I met Sylvain in 1995." Chomet, a comic-book illustrator, employed Tomov painting backgrounds for the prize-winning short, La Vieille Dame et les pigeons (1997). "It put Sylvain on the map, and got three producers to invest in the feature project. On Triplets, I didn't start out as the art director. Sylvain had the first one fired after a couple of months. He was too slow, didn't communicate. I inherited very little: ten or fifteen drawings in pre-production. "The film was not organized in a very orthodox manner. You see lots of credits, but we never had more than forty of fifty working at a time. That was Sylvain's decision; he could have a more homogenous look. I took care of everything in the film that doesn't move, including color and lighting, layout and background painting. It was tough sometimes, one-and-a-half years, six days a week, working 9 to 8, 9 to 9. "I didn't develop the characters. That's all him, the personalities, the look. Sylvain did the entire storyboard. He's a great animator and a great generator of original ideas. Even under stress, he remains creative. He was definitely the locomotive pulling the train forward. I've never worked with someone who is so multi-talented, a Renaissance talent. He draws very well, he's an excellent draftsman. He plays piano, he has a great ear. He fired two composers who didn't work out. "It's great working with him, but not easy. It wasn't always a positive experience, it was a package deal. He has a short fuse, a short attention span. I was perhaps the only one spared from being yelled at. A reason there are so many names on the credits: many people quit. Sylvain keeps telling me that I was more picky than him, which may be true, but I had a more smooth approach with people." What influences did he and Chomet have when conceiving the animation? "Sylvain credits [live-action] filmmakers like Jacques Tati, not well-known cartoons. I looked at paintings and live-action films for ambience and atmosphere. I admire the stylish art direction of City of Lost Children and Delicatessan, and Tim Burton is a great director, but I didn't imitate them. We did look at a bit of 101 Dalmations for the freshness of black-and-white lines, wobbly and sketchy, merging with the actors. Of course, nobody can claim 100% originality, but I can't think of a single title which we really copied." And the marvelous composite-town of Belleville? "I had complete freedom to design my own city. An exhibit at the Montreal Fine Arts Museum of baroque architecture was a springboard we had to jump from. In Belleville, there's a lot of Montreal, a lot of Quebec City, Paris rooftops and penthouses, garnished with baroque elements. Door hinges, street lights, gutters, are based on the black-and-white photographs of Jean Monique and Robert Doisneau. There's New York as well: the Statue of Liberty, and people laugh at it being there, in what's supposed to be a French city in the New World. But it was a gag we couldn't resist." 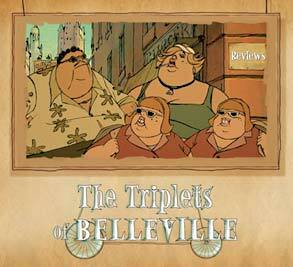 Triplets of Belleville opened last June in France, and it was a critical success and somewhat of a box office hit. Here, the Boston Society of Film Critics voted it The Best Foreign Film of 2003, over every live-action movie. "Sylvain is certain that Triplets won't succeed in North America," Tomov said. "I'll be happy to prove him wrong." I just read with great interest your interview of Mr. Evgeni Tomov for the animated feature "The Triplets of Belleville." I would like to rectify certain facts. To make a long story short, I have been involved on this film and this from the very beginning, even before the preproduction stage (a long time before Mr Tomov started). I remember looking for a small commercial place to rent with Sylvain Chomet to start the preproduction as well as being involved in presentations to Telefilm Canada for the financing of the project. So, I was hired as the art director of this movie and while the director was storyboarding I was doing preproduction styling as well as developing a technique to paint digitaly the backgrounds to match "The old lady and the pigeons" beautiful watercolored backgrounds. In may 1999, after 9 months of preproduction work, I hired Mr Tomov to assist me on the background layouts. The background layouts production started in mid-july and I supervised a crew (including Mr Tomov) until february 2000 where a conflict with the producers (and undercover the director) over the respect of my contract conditions forced me to leave. Therefore, I have been for 17 months on the project, designing and drawing over 65% of the main background layouts of the movie. Which is to say that Mr. Tomov is an impostor. When he pretends that he imagined the city and the designs of the backgrounds, he is lying. My statement here is not to undermine Mr Tomov work or competence as he obviously has supervised the rest of the production layouts and the backgrounds painting after I left but to put things back in perspective. I have been deliberatly cheated or screwed which onee you prefer, over the credits of this film by the director,( knowing Sylvain Chomet it was predictable) and I tried to get over this since the release of the film at "Le Festival des Films du Monde" in Montréal. But for the first time, in your article, Mr Tomov on his own is directly upfront taking all the credit. You will understand that the film being nominated for an Oscar will only make my pain and sense of injustice growing. Working on a feature involves a lot of energy and personal involvement. I have been in the cartoon business for over 30 years, working with celebrities like Chuck Jones, Maurice Noble and more and never I have seen this kind of pittyful situation. I'm not looking for celebrity, I just hate that cheaters take credit for my artwork. I have all the documents (contracts, copies of my work, color designs, invoices...) to prove what I'm putting forward. I attached some to this letter. I would of course appreciate some rectifications over your article. Evgeni here (the art director of The Triplets of Belleville). I came across (with a big delay, though) Michael Breton's "response" to the interview you took with me at the Toronto film festival. It was sad reading this bitter man's accusations (some of them quite insulting). I am not going to get into humiliating arguments with someone who apparently feels very frustrated about missing a chance to be a part of something significant. It is sad to see that somebody is trying to get fame by discrediting another artist. Just for the record: I was not hired by Michael but by Sylvain Chomet, with whom I had worked 4 years earlier on The Old Lady and the Pigeons; Michael did not "supervise the team" while still on the production, for there was no team yet but only me; he did not leave for the reason of a vague conflict with the producers but he was asked to leave by Sylvain Chomet; the digital painting technique was developed by the lead digital painter Thierry Million months after Michael was fired... no need to go further. I am not taking all the credit - the film was a collective effort by a group of talented artists and Michael was just one of them. Everyone was credited accordingly for what they actually did for the film, not for what they were trying or wanted to do. After I read this I won't be surprised if the two previously fired composers claim that they did the music for The Triplets... Luckily not every artist's ego has the same proportions. Invoices do not prove creative input. I will try to remain Zen and not let the insults affect me, for now I need to concentrate on the development work we are doing with Sylvain Chomet for the first Miramax animated feature film, which he was asked to write and direct. It is your choice whether to publish this as well as a "response to the response" or just delete it. I am not interested in getting into endless ego-driven arguments. I have a lot of respect for your work and for your passion about movies and I just wanted you to know that in Toronto you did not talk to "the wrong guy".